For the mobile game, see Bruce Lee (Mobile). 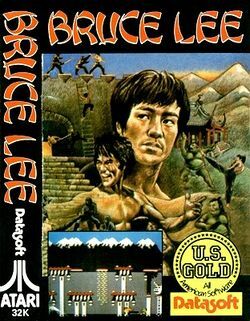 Bruce Lee is a video game designed by Ron J. Fortier, with graphics by Kelly Day and music by John A. Fitzpatrick. It was originally published for the Atari 8-bit and Commodore 64 by Datasoft Inc in 1984. Bruce Lee was converted to the ZX Spectrum and Amstrad CPC and published by U.S. Gold in the same year. An MSX version was published in 1985 by Comptiq. Each chamber is guarded by two mobile enemies; The Ninja, who attacks with a bokken stick and The Green Yamo, who attacks with punches and kicks. A multiplayer modes allows a second player to control Yamo, or to allow two players to alternately control Bruce. The Ninja and the Yamo are also vulnerable to the screen's dangers, but have infinite lives so they always return. If the player playing the Green Yamo is inactive for a certain time, the computer takes over. Later chambers include more hazards such as mines and moving walls, as well as a "comb-like" surface that has an electric spark racing along it. Skillful walking, climbing, ducking and jumping are required to negotiate them. On the twentieth screen, Lee finally faces the evil wizard. Cover art for the Commodore 64/128. Cover art for the ZX Spectrum. archive.org: Video walkthrough for the Commodore 64 version. This page was last edited on 13 June 2013, at 04:22.